After nearly 12 years of restoration construction, the historical Joseph Knight Sr. Ancestral Farmhouse in Nineveh, NY is open for visitors. Originally built in 1815, the Joseph Knight Sr. home has been beautifully restored with authentic artifacts and furnishings complementary to the time period and historical authenticity of rural New York State. Volunteer docents live in accommodations annexed to the home and conduct tours for individuals, families, and tour groups. They are available at 607-693-1266. 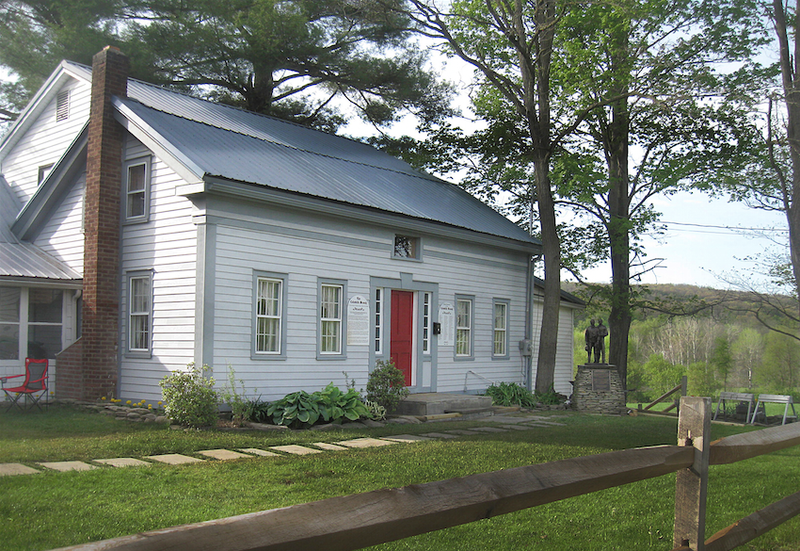 Also completed is the Josiah Stowell home in Afton, NY, less than a mile east of the Knight home. Stowell figured prominently in early Church history. In Afton, Joseph Smith and Emma Hale courted, married and honeymooned. Both homes are finished in museum-quality condition. They represent historical centerpieces to the early period of the Restoration of The Church of Jesus Christ of Latter-day Saints, a history which has largely been neglected to date. The Joseph Knight Sr. family is remembered as being close friends of the Prophet who furnished support to his translation of the Book of Mormon. They formed the Colesville Branch of approximately 82 members, which was centered at the Knight home, with Hyrum Smith as the first branch president. As millers, Newel Knight and Joseph Knight Jr. constructed as many as eight gristmills to provide flour to starving Saints over six Mormon migrations. The Knight family remained true and loyal to Joseph Smith and Brigham Young, when other leaders and members failed to support them. The “Cradle of the Restoration” represents five early sites of the Church starting in Palmyra with the First Vision of the Father and the Son to Joseph Smith Jr. and the eventual publication of the Book of Mormon. A short distance south is the Peter Witmer Jr. farm at Fayette, NY. Here the Church was officially organized among other events. Approximately two hours further south is the Knight home in the hamlet of Nineveh, formerly called Colesville Township, and the Stowell home in Afton, NY. The Joseph Knight, Sr. Farm – Location of the Colesville branch the first branch of The Church of Jesus Christ of Latter-day Saints. Driving south 25 miles down Windsor Road along the picturesque Susquehanna River, where the Melchizedek Priesthood was restored, is the Church’s newly finished historic Priesthood Restoration Site, dedicated September 19, 2015, at Harmony, PA. There are inspirational historical presentations to see in the new visitors’ center, the Isaac and Elizabeth Hale home, the cabin home of Joseph and Emma Smith, where over 70% of the Book of Mormon translation took place with scribe Oliver Cowdery, the sites of the restoration of the Aaronic Priesthood by John the Baptist, and the baptisms of Joseph and Oliver. With the openings of the Knight and Stowell homes and the Priesthood Restoration Site, combined with the history of Palmyra and Fayette, NY, visitors now have a more complete picture and expanded appreciation of the early events of the Restoration of the Church, its first members, and the consecration of the Prophet Joseph Smith. Three families privately own the Knight and Stowell homes: Raphael and Shari Mecham, Steve and Pat Glenn, and Paul and Ann Painter have guided the restoration of the two homes using their own and Knight family organization resources and volunteer help. For information, contact Raphael Mecham at 480-323-5947 or through email: craphaelm@msn.com . The address of the Joseph Knight home is 1963 East Windsor Road, Nineveh, NY 13813. Visit colesville-restoration.com and josephknightfamily.org. A tour for descendants of Joseph Knight Sr. and the Colesville Branch, is now offered through Mormon Heritage Association for September 12-15, 2016. Contact Patty Steadman, 801-272-5601 or email: info@mormonheritage.com . The tour features all five Restoration sites. My wife and I spent several weeks as docents at the Joseph Knight Sr. Ancestral Home in Nineveh, NY. We felt a constant blend of the sacred and historical each day and treasured our heritage in the Knight family and Colesville Branch. It is a pilgrimage all should include in their New York travels. Thank you to Meridian Magazine for this timely article. May it reach all who have the Spirit of Elijah with them. As one of the owners/restorers of this sacred site I would like to express my appreciation for this article by Meridian Magazine. From my perspective it is well written and factually correct. Though we as owners have invested considerable blood, sweat and tears over the past 13 years, what you see today would not have been possible without the considerable help we have received from many, many volunteers from across the land. The reward for our work that we all treasure is that of being immersed in the spirit of the home. It is truly a sacred place!